Backwater is an exhibition of new photographic and video work begun in 2005 while Ferran was in London on an Australia Council Residency. Her studio was located in a part of East London that has been heavily industrialised for centuries and is criss-crossed by rivers and canals. It is also the area destined to become the principal site of the 2012 Olympics and the focus of a major urban redevelopment. The waterways of the lower Lea are predominantly tidal. Ferran saw their regular ebb and flow as a metaphor for the way things disappear and reappear in cycles of use, disuse and neglect. Cautioned to not go wandering in this empty and unfrequented area, Ferran ignored the warnings and discovered a world that absorbed and delighted her. Much of the material in the exhibition was gathered over a three day 'journey of discovery' which Ferran likens to a 19th Century exploration into the unknown. The work is a meditation on time, with a slow moving image across two video screens echoing the repetitive, tidal rhythm, exhibited with photographs that show this environment as resurgent and strangely beautiful. Ferran's work has often looked back on the remaining evidence of a previous time in history. This new work does so with detachment and poignancy. 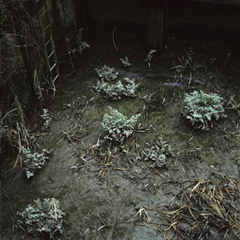 Anne Ferran's last exhibition at Stills Gallery was 1 D 38, in 2003. She has been exhibited widely since 1984 and is currently Senior Lecturer in Photomedia at Sydney College of the Arts, University of Sydney. She won the Gold Coast Ulrich Photographic Art Award in 2003, and her work is held in the collections of many major galleries and museums in Australia and New Zealand.